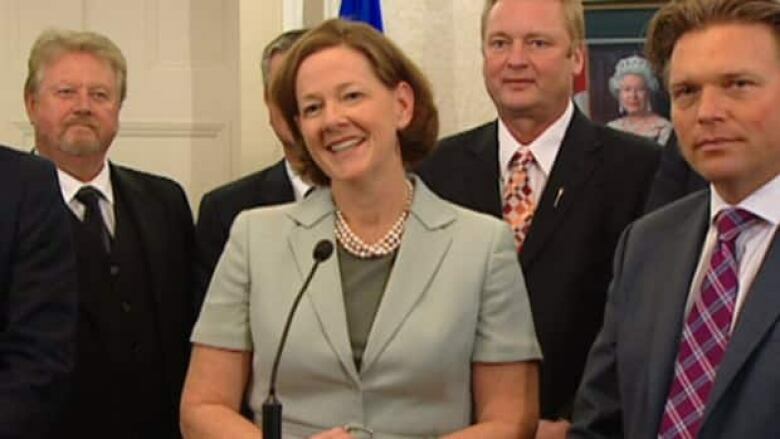 Former Alberta Health Services chair Ken Hughes and former Calgary alderman Ric McIver were among the newcomers appointed to Alberta Premier Alison Redford's new cabinet on Tuesday. Hughes was named Alberta's new energy minister, replacing Ted Morton, who lost his seat in the April 23rd election. McIver takes over the transportation portfolio. Other newcomers include former Calgary principal Christine Cusanelli, who will head Tourism, Parks and Recreation and St. Albert businessman Stephen Khan, who is the new minister of enterprise and advanced education. Some backbenchers were promoted on Tuesday: Grande Prairie-Wapiti MLA Wayne Drysdale becomes minister of infrastructure and West Yellowhead MLA and former PC party whip Robin Campbell will be the minister of aboriginal relations. Some familiar faces return to cabinet: Doug Horner becomes minister of finance, in addition to his previous role as president of Treasury Board; Dave Hancock remains minister of human services; Fred Horne continues as minister of health, and Doug Griffiths will stay at municipal affairs. Redford has combined some portfolios under her new cabinet structure. Environment and Sustainable Resource Development will be the responsibility of Diana McQueen, and Jonathan Denis will be solicitor general and minister of justice. Thomas Lukaszuk, who served as education minister in Redford's first cabinet, was named deputy premier, but will not be responsible for any ministries. He will instead chair the operations policy committee. "We are going to forge new policy, new directions. We're reorganizing government. We're going to change the role of the legislature," Redford told reporters after her new ministers were sworn-in. "I want to have a strong deputy premier by my side who's able to help advance that government agenda." Redford also appointed seven assistant ministers, who including former cabinet minsters Greg Weadick, Frank Oberle and George VanderBurg. Assistant ministers will attend cabinet meetings when their area of responsibility comes up for discussion, Redford said. While Wildrose Leader Danielle Smith criticized Redford for not appointing a Fort McMurray MLA to cabinet, she praised her for decreasing the number of ministers. "Often what happens is that you see a premier wanting to reward so many allies that she increases the size of her cabinet," Smith said. "But I'm glad Ms. Redford resisted that temptation and has kept the cabinet to a reasonable size." While Hughes is new to the Alberta legislature, he served as a Conservative Member of Parliament from 1988 to 1993, which he says gives him an understanding of how government works. "I also understand from deep personal experience how the energy industry works," Hughes said. "With that combination that overcomes a lot of things in being able to become quickly seized of the issues in the energy portfolio." As Alberta's new transportation minister, McIver will have to deal with growing calls to twin Highway 63, the heavily travelled link to Fort McMurray and the oilsands. While McIver is open to the idea, he also believes people should drive more carefully. "The sheriffs are out and wrote over 600 tickets last weekend," he said. "So there's a responsibility on behalf of the government to make sure the road is safe, there's also a responsibility of all Albertans to look after each other and do safe things while we're driving." One of the biggest surprises was Redford's decision to appoint Stephen Khan, the newly-elected MLA for St. Albert, to a cabinet post. Khan says his experience in the software business will help him adapt to his new job. "I've got a lot to learn," he said. "The software business is always a business where you're moving forward and you're learning a lot all the time." Redford started announcing her new cabinet through her official Twitter account a half hour before the 1:30 p.m. ceremony at Government House. The legislative assembly will resume for a short session two weeks from now where MLAs will elect a new speaker to replace Ken Kowalski, who is stepping down.